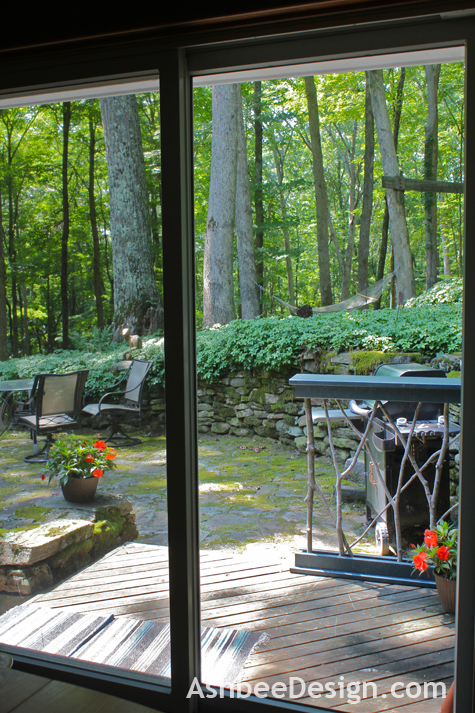 If you are sitting at our dining table enjoying a delicious meal, you will also enjoy a scenic forest view out the large glass doors. Unfortunately that is the long view. 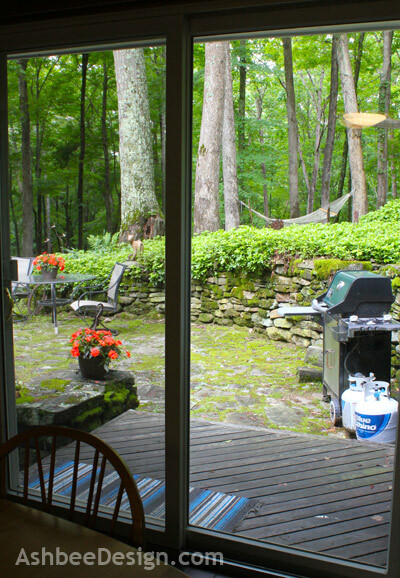 The near view is of the gas grill. Yup, right there just six feet out in all its undesigned glory. Face it, the gas grills most of us have are ugly. Our is. I decided to create a screen to improve that view. I have been thinking about it for awhile and even posted it as one of the design challenges I wanted to address. I didn't want a solid solution to block the light and air flow but an open screen. 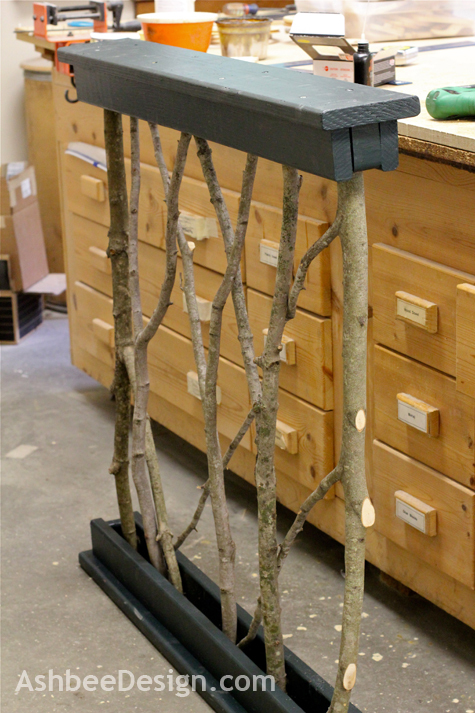 I have been working on a rustic solution (most appropriate here in the woods!) and will share with you the process along with photographs. This is what I see today with the grill screen structure complete. My solution was to build a fence using some of the branches from the storm damage last fall. 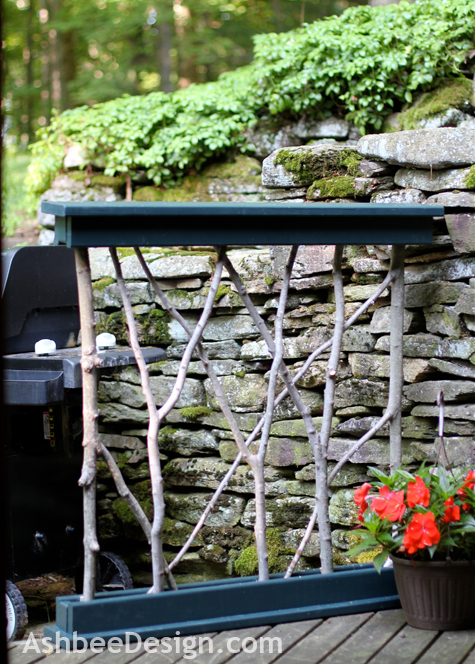 I supported it with a top and bottom keeper frame constructed from pressure treated lumber and attached it to the existing small deck between the grill and the dining area slider. My inspiration came from this garden gate which crossed my Pinterest world several weeks ago. And here are my before and after photos taken from approximately the same location. 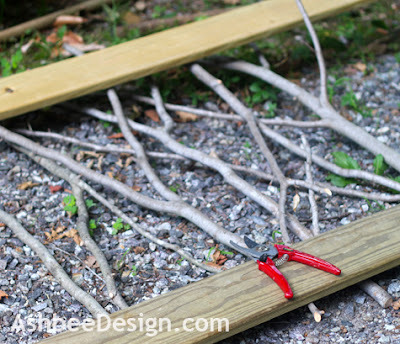 I am really liking the fence and the natural branches. I am still working on adding some other ideas to some of the spaces - but that is for the next post so stay tuned! 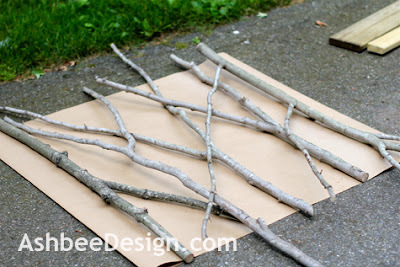 I started by collecting branches. These were from the brush piles of debris, not green wood but not old and brittle either. I was specifically looking for ones with Y branches to use. I found that I need quite a variety to have flexibility with the composition. Originally, I had thought that I would use many thicker branches but once I started arranging them, I was much happier with the thinner ones. As I laid them out I adjusted the location of intersections and the pattern of the interweaving. I cut a pice of brown paper the actual size of the finished fence and worked on that surface to refine my design. Once I had the layout of branches finalized, I marked them all clearly with magic marker. This helped getting them back in the same location. I also marked where I wanted to cut them and then cut them all on the band saw although these were small enough that a hand saw would have worked as well. My construction technique was to use pressure treated decking which is 1 x 6" (Which in reality means it is only 5" wide.) 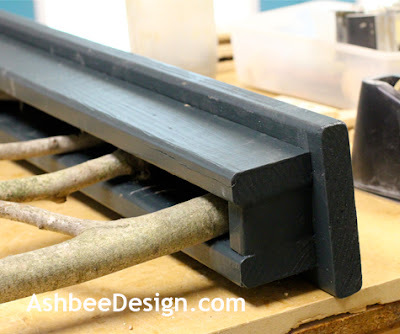 I used a full board for the base of the keeper and split a board lengthwise to create the two side rails. 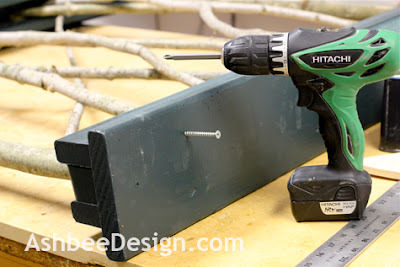 I screwed one rail and both ends together using deck screws. I left off one of the rails to allow for assembly later. I then painted all the pressure treat with exterior house paint that matches our doors. 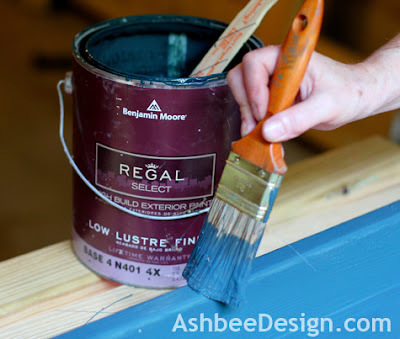 The color is Benjamin Moore Regal Green and although it looks teal when wet it dries to a much darker green. This green is one shade deeper than the stain on our house. Below is a great view of the parts placed together. Because of the free form nature of the branches I decided to leave open one side of the end frames, place the branches, screw them in place and then screw on the last side of the keeper. 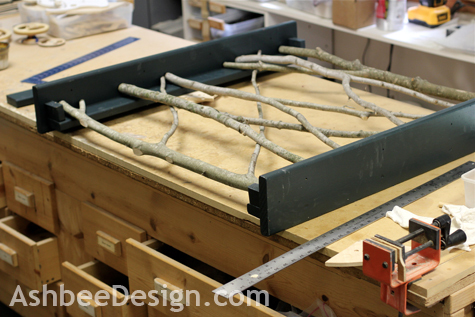 I was worried about how the irregular branches would fit. I moved indoors because it was blistering hot outside and it was easier to work up on David's workbench. 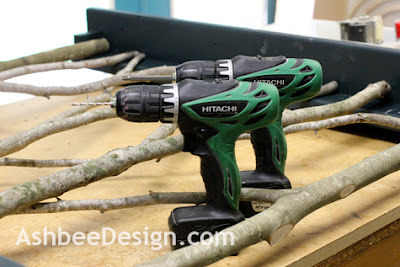 I pre-drilled holes into all the bigger branches about 1" from the end. I didn't want them to split from the screws. 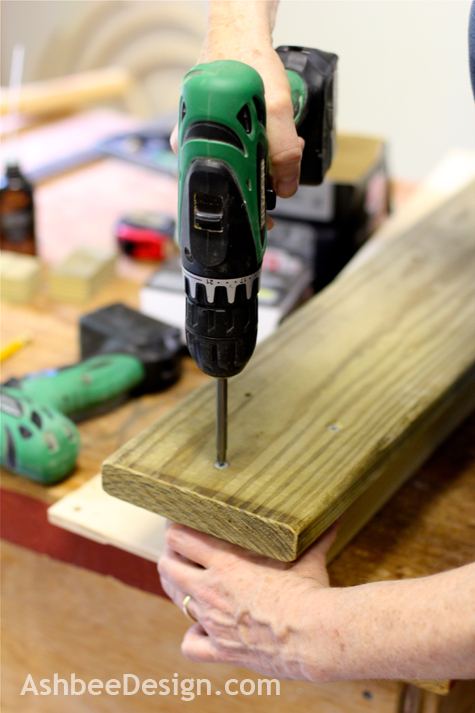 It saves a lot of time to have two drills, one with the drill bit and the other with the screw driver bit. All I need is a twin holster and I'd look like a cowboy! 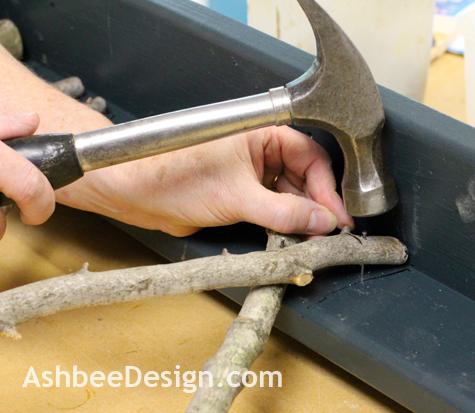 The smaller branches I pre-drilled with a tiny bit and used small nails to anchor them. They aren't providing any support but I wanted them fixed in place. Both the screws and nails will be hidden by the final keeper strip. After all the branches were either screwed or nailed in place, I screwed the last keeper in place. The screws were counter sunk and the holes filled and repainted. Here it is in its final location, obstructing the view of the gas grill. Quite an improvement. But there is more to come because those spaces in the branches are just calling out for additional creativity! Visit again in a day or two to see what other ideas I am working on. 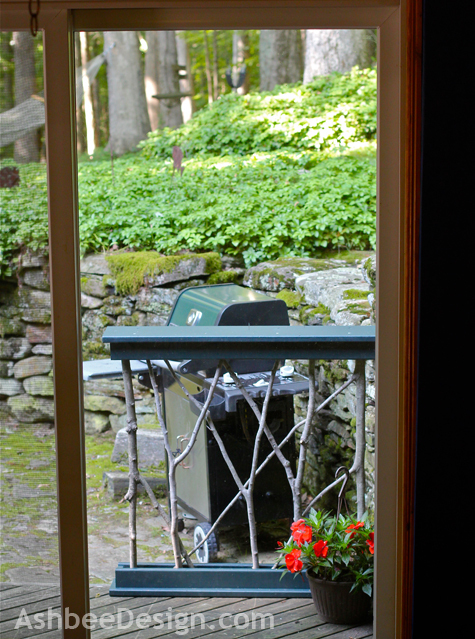 I have just posted about the first addition to this grill screen. Click here to see the mini tea light lanterns I crafted for the spaces. Easy and romantic! Thanks for visiting and commenting. Be sure to come back and see the enhancements tomorrow or maybe not until Thursday! The vision and the art only improve by doing ( and by looking at tons of inspiration on Pinterest!) I didn't photograph and share all the branch layouts I didn't like. I really enjoyed seeing how you put this together. It turned out really good. Maybe, just maybe, I'd be able to make one myself. Visit again to see what else I have planned for this screen. Still easyand doable! Marji, that is beautiful! It completely complements your gorgeous view. You are so talented! Thanks Bettsi. I agree about the view and fell blessed regularly. It is always good to go on a trip and then return home to be reminded of how beautiful this part of Connecticut is! AMAZING!!!! Not only can it hide a grill.. I can easily separate two spaces.. so UNIQUE!! I see this screen as a solution to many division problems- probably even better indoors. Imagine it as a room divider in and open spaced loft? 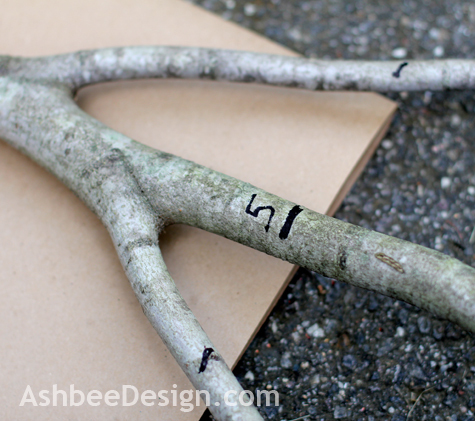 We have so much downed branches that it has continuously inspired my crafty side. Thanks for visiting and commenting! I love your screen. What a creative use of broken branches. The result is beautiful. Welcome to the site Yael. Have you seen my Red Dancing Sticks yet? Great for gardens. 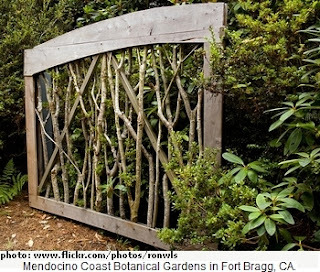 Been looking for some garden blogs. Off to visit yours. Stay tuned to see the variations! Thanks for visiting. what a clever idea. I love the rustic look of the branches. 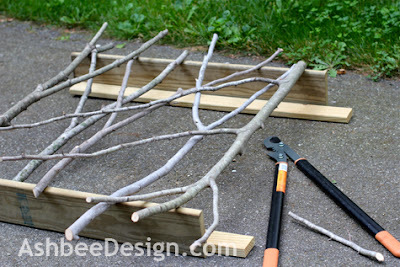 What a great way to use and recycle broken tree limbs. I am digging the rustic look as well. Works here in the woods! A climbing plant would be lovely....except everything I put in this corner dies! No light and no green thumb! Larry, I have seen and loved similar interior railings as well, also ones forged out of metal to resemble branches. 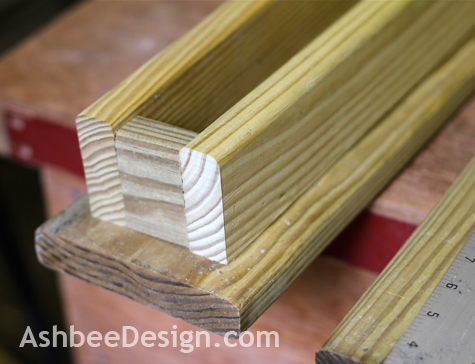 Here is a link to an earlier post on my blog about stair railings. 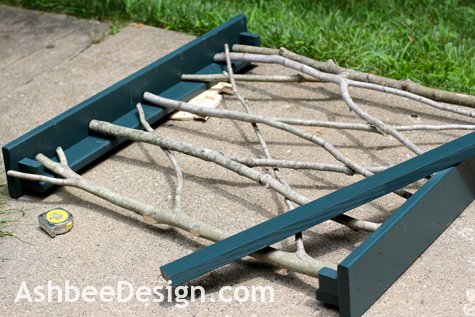 And at this post there is a beautiful metal railing as well, all branch themed. Wow - nice job. It looks so fabulous!! Thanks for linking up at Romance on a dime! Pinning this. Oh Em Gee. This is amazing!! Thank you for sharing - Love it! This is so awesome and one of the most unique projects I've seen in a long time. Thanks for linking to the Home Decor and Organizing Link Party. This is one of my features today. As you can see from the above comments I have been sharing this on lots of links parties. My thanks to everyone hosting the parties. It seems to work for sharing ideas. 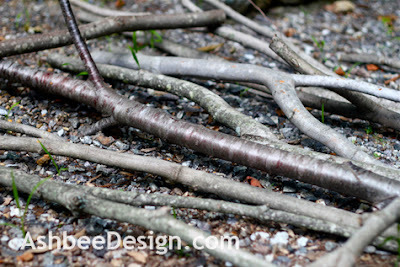 time to pick up some sticks!!!!!! I can do this to disguise our ac unit! I think! Great idea! I can see this working in different sizes or densities for all types of house uglies, ac units, garbage cans, grills, etc. I'm featuring this tomorrow at Romance on a dime's TIOT party! Such a beautiful project, Marji! Wow! Great tutorial too! I also check out the ideas for filling in the space (the candles and wood disc flowers) and both are adorable! I love it!